Throughout their school years, teenagers are subject to a lot of stress. There’s more to learn than ever before, and a much greater emphasis on grades, especially at GCSE and A level. It’s no wonder that they feel under constant pressure to learn, achieve and perform. While much of the stress comes from school situations, especially at exam time, social factors – friends, boyfriends, girlfriends – can also contribute to the feelings. There are many ways in which stress can manifest itself, both physical and mental, and you need to be aware of them all, and alert to the signs. Stress is a major problem among teens, possibly even more than it is among adults, because they don’t have the experience or maturity to be able to cope with it. Physically, at times it can be hard to distinguish stress from a normal teenage rebellion. There could be moodiness or defiance, but it would seem more extreme than usual. If your teen is depressed or appears sad for extended periods, this, too, could indicate stress. Sometimes the physical signs are quite apparent, with the onset of asthma attacks or eczema on the skin, in which case you should take your teen to the doctor immediately. Stomach aches and headaches occur commonly when someone is stressed. You can treat the immediate symptoms at home usually, but you still need to address the underlying cause. Swings in appetite could be a sign, whether it’s eating far more or far less than normal, whilst problems sleeping, especially if accompanied by nightmares, stand as a definite indicator. 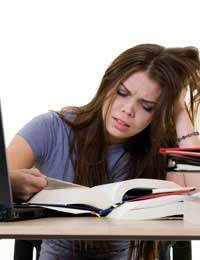 If your teen begins smoking, or using drugs, it could be due to stress, too, as could not being able to concentrate properly on schoolwork. Perhaps the hardest thing to deal with is if you teen begins experiencing panic attacks. These can be terrifying, not only to the victim, but to those around. Again, you can get them over the attack, but you still need to help them deal with the stress in order to stop them completely. The biggest thing you can do is not put any pressure on them yourself, asking why they’re not achieving better marks, for instance. Think about it: it’s bad enough for them at school without you adding to the demands. Make sure they have plenty of free time, rather than a packed schedule of activities – teens need to relax too! Watch them and talk to them. If they seem to be suffering from stress, gently point out that they seem to be upset, angry, or whatever. Certainly never tell them to get on and snap out of it. You need to empathise, not criticise! Be on their side, and see their point of view. Be sympathetic in your comments and put yourself in their position. If there are specific, concrete problems to overcome, work on a solution with them. It builds a bond between you, and that can be useful with the next problem that occurs. You have to be willing to initiate the conversation about stress. All too often teens don’t have the experience to understand what’s happening, but you do. You might suggest going for a walk together, and talking as you go. Different surroundings can encourage conversation, and exercise can also be beneficial, especially if done regularly, as stress relief. Break big problems down into smaller, more manageable ones and work on the answers to them with your teen. It helps them gain confidence, and can certainly reduce stress levels once they learn these things aren’t insurmountable. Be available to give emotional support, especially at exam times, when the stress is at its greatest. Make the time to talk, and encourage them to discuss their worries and fears. Simply talking about them can lessen them. You can’t solve all their problems, and nor should you – part of growing up is learning to deal with them. But you can help them along the path.